Pra Kru Tri Gaay 2480 BE - Luang Por Ngern Wat Don Yai Horm (2433 - 2520 BE). 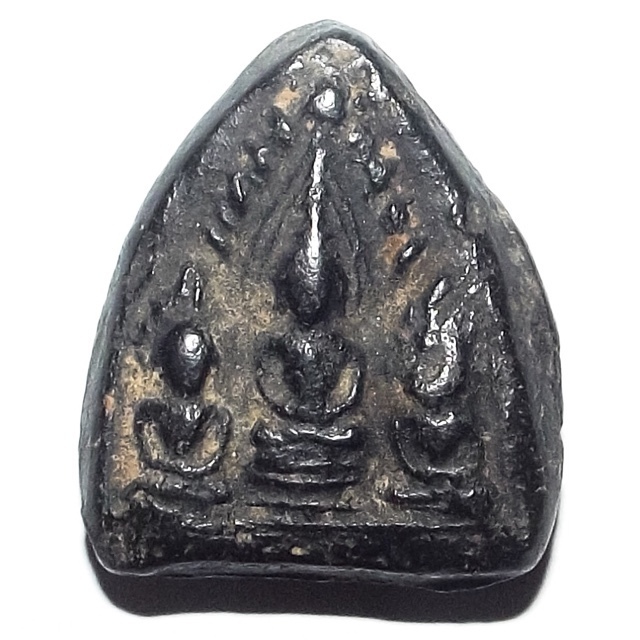 The Pra Tri Gaay amulet is one of the rarer amulets of this Great Master, and also a highly preferred classic of Luang Por Ngern's Great Pantheon of Amulets. The amulet is made from Nuea Din Saksit Long Rak - Sacred Clay made from earths taken from ancient holy sites mixed with other sacred powders, and then covered with black herbal lacquer. This is one of the early era models, which he began making around the Year 2480 BE, and continued to make further editions through the following two decades. Luang Por Ngern made another style of this amulet 37 years later in 2517 after a block press modl was found in a Kru Burial Stupa from the ancient Lopburi Periodic era, and was used to press some different models in the 2517 BE editions. The front face of the amulet depicts Three Buddha Images within a lotus petal shaped frame with a crystal arch aura (rasamee) around them. All three Buddhas are sitting in Samadhi meditation. The rear face of the amulet reveals hand pressing, and has traces of the thumbprints of the Master upon it, which are still visible through the black lacquer coating. This is a Pim Klang medium size model measuring 2.8 x 2.3 Cm, and is a highly attractive acquisition for any true Buddhist, or devotee of Luang Por Ngern Wat Don Yai Horm. For collectors of the amulets of the Lineage Masters of Wat Don Yai Horm this is an essential rarity to complete the showcase with, and is an extremely sacred amulet design which has been made over many many centuries of Thai Buddhist History, making this also an extremely valuable historical artifact indeed. Luang Por Ngern had been making the Tri Gaay amulet for many years throughout the middle and latter part his ordained life, beginning in 2480 BE and many editions were made before the Year 2500 BE in Sacred Powders, But since the year 2517 BE, a different model was made from the Mae Block Pim which had been discovered from an Ancient Lopburi Era Burial Place Kru Chamber find during an archeological dig under the site of the sacred shrines. That later edition was called the 'Munlaniti' edition - the Pra Tri Gaay of that later edition was released along with another amulet, in different version, namely one of Luang Por Ngerns Classics, the Pra Baramee Sip Tat (see below image). The Pra Tri Gaay three meditating Buddhas amulet of 2480 BE, was made in three different models; Pim Lek (small), Pim Klang (medium) and Pim Yai (large size).